With its unique software platform, ClinicAll improves the workflow for healthcare givers by reducing the administrative work in hospitals, simplifies the communication between patients and doctors and improves treatment quality for the patients. The new ClinicAll Health Community project is intended to give easier and faster access to healthcare-related services and products to anyone. ClinicAll intends to create added value in healthcare solutions for every individual, both in hospital environments as well as outside of hospitals or medical centers. Hospitals have long relied on traditional IT networks and information systems. But these are often older stand-alone solutions that lack the amount of integration and connectivity that is needed for state-of-the-art digital hospital operations. Today, hospitals are still using outdated analogue, paper-base administration and many of their older digital data systems are inefficient. ClinicAll developed a specialized software solution that enables patients, doctors and staff to communicate and share data and information within any hospital. ClinicAll either also provides proprietary hardware devices for hospitals that are installed at the patient’s bedside, i.e., directly at the point of care. In addition, all IT hardware that doctors or staff use also runs the same software. The newest development is the ClinicAll Mobile App which was launched in 2018. For the first time, all types of healthcare-related services are now seamlessly integrated into one platform, accessible worldwide via the Mobile App. Through this Mobile App, ClinicAll will continue its mission by providing healthcare related services and products on a worldwide basis – beyond the confines of a clinical environment. To achieve this, the CHC ClinicAll Health Community will be created. As a member of the CHC, you will have full access to ClinicAll services as well as to all offerings of participating CHC service providers and product partners. The ClinicAll Token (CHT) takes advantage of the already existing ClinicAll infrastructure and software solutions, and supports the growing relationships with hospitals as well as product and service providers all around the world. After six years of refinement and intensive development, the first ClinicAll software and proprietary ClinicAll terminals with Infotainment capabilities are installed in German hospitals by ClinicAll Germany GmbH. ClinicAll International Corporation is founded, with its office in New York, in order to better position its products in all markets around the world. Its main operating subsidiary was in Germany. In the years following 2010, subsidiaries are founded in Austria, France, Spain, Switzerland and North America serving not only their home countries but others as well. The first clinics in Spain and other countries introduce ClinicAll systems. Software is added to provide access to and integrating hospital functions. ClinicAll enters into a strategic partnership with Microsoft. A Windows based software is launched for the first time on end devices in clinics, and ClinicAll gains a unique position in the market, and pursues the goal of revolutionizing the market for patient bedside accessible software. Third-party software could now be easily added to the ClinicAll system. ClinicAll rolls out the ClinicAll Software App v2.0, which provides real-time multitasking for TV/Internet/telephony and additional hospital service applications. For the first time ever, HIS including EMR are fully integrated, enabling doctors and staff to access and edit patient data directly at the point-of-care, the bedside. Automated patient check-in is carried out via ClinicAll terminals for the first time in the University Hospital of Golnik / Slovenia. More than 200 ClinicAll systems are installed in Saudi Arabia with new customerspecific screen design integrating 24 applications – from the digital Quran to HIS integration. Additional international deals are closed. The German Federal health minister visits the ClinicAll’s German headquarters and gives a presentation on "The Significance of IT and Digitalization for Future Supply Structures". 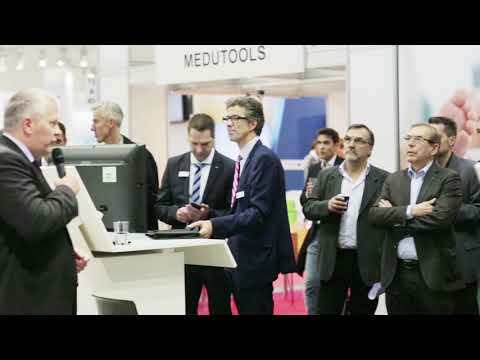 ClinicAll provides a live demonstration of a digitally networked hospital environ ment at the conhIT exhibition with a wide range of new features integrated in the ClinicAll App. After equipping the leading private hospital group in Saudi Arabia in 2015, ClinicAll opens negotiations with several governments in GCC to equip military hospitals as well as private hospitals groups. More than 600 ClinicAll systems are installed in the first hospital in Qatar. The Community Mobile App is released, tying together users and sponsors and permitting users to employ their own devices in hospitals and healthcare centers. Full Mobile App Rollout and launch of ClinicAll Healthcare Community. Blockchain releases for sandbox and bug testing bounty campaign and activation of CHT Token usage. Start of bounty campaign for CHT Token holders. Activation of CHT Token usage at ClinicAll bedside terminals. Activation of CHT Token usage for ClinicAll Mobile App. Sandbox and bug testing doctor to patient communication platform within the ClinicAll Healthcare Communit. Rollout of doctor to patient communication platform. Start of CHT Token usage within whole ClinicAll Healthcare Community partner network. Enabling members to save all personal health data and information that they want to within the blockchain. Identification of patient / user groups. Development and launch of integrating 3rd party apps and devices (e.g. wearables) to enable them to save personal health data within the ClinicAll blockchain.